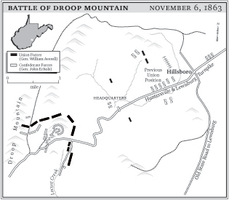 The Battle of Droop Mountain opened with nearly six hours of artillery fire, musketry, and hand-to-hand combat. Averell’s infantry finally broke through the Confederate left. The Rebels retreated, and the battle turned into a Union rout. On November 6, 1863, one of the most important Civil War battles in West Virginia occurred in Pocahontas County. Union General William W. Averell launched a raid, to trap Confederate troops around Lewisburg. He was able to attack some 1,700 Confederates under General John Echols at Droop Mountain, just south of Hillsboro. The battle opened with nearly six hours of artillery fire, musketry, and hand-to-hand combat. Averell’s infantry finally broke through the Confederate left. The Rebels retreated, and the battle turned into a Union rout. Gen. William Averell failed to achieve his ultimate objective. However, Droop Mountain marked the last large-scale battle of the war fought on West Virginia soil.